Mayor Shin Yeon-Hee of Gangnam City (Gangnamgu) meets with Mr. Suriyon Sriorathaikul, managing director of the Beauty Gems Group of Thailand in her office in Seoul on June 21, 2013. Mayor Shin Yeon-Hee of Gangnam City (Gangnamgu) met with Mr. Suriyon Sriorathaikul, managing director of the Beauty Gems Group of Thailand in her office in Seoul on June 21, 2013. Mr. Sriorathaikul led the business delegation of one of Thailand’s Thailand’s largest gems and jewellery wholesalers and retailers to South Korea to explore ways of establishing their shop in Seoul. Beauty Gems recently celebrated their 45th anniversary with a grand exhibition of some of their work through the ages. 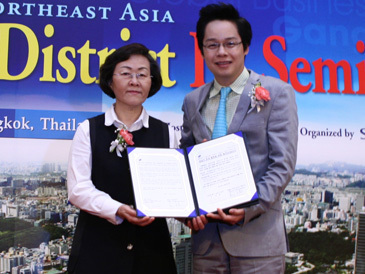 Earlier on May 28, 2013 Mayor Shin signed a memorandum of understanding (MOU) with the Beauty Gems Group in Tahiland. During their stay in Seoul Mr. Sriorathaikul conducted a market research to open their shops around the country in South Korea. Mayor Shin promised Mr. Sriorathaikul that Gangnam City would provide all the information and administrative procedure in the meeting. Mayor Shin showed Mr. Sriorathaikul and his delegates in and around Gangnam City including COEX mall and the Cheongdam-dong luxury fashion street.